How bad is it, really? Before ephemeral Youtube piracy made such things easy, seeing this movie became a sought-after prize in certain circles of bad movie afficionados. VHS copies were surreptitiously traded, rather like The Star Wars Holiday Special. So naturally, as has happened with other “lost films”, it developed a reputation — one might even say a mystique. There’s even a documentary telling the true story of this legendary film. Now I can finally answer the question: does it live down to the hype? How bad is it? The sad truth is that, though production-wise it’s a very cheap Z-grade film, and the cast is both untalented and uninspired... it’s really not much worse than the big-budget Tim Story film of 2005 which is reviewed below. In terms of writing, I’d say it’s better. And between the two films, this one has definitely got the superior Dr. Doom. 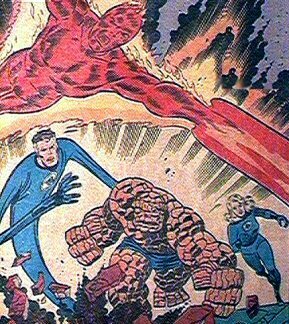 It also gives the Four a bit more to do in terms of overcoming opposition, in that there are two bad guys — they make up a guy called The Jeweler, who is not based on anything from the comics. He kidnaps Alicia Masters, the woman who will become Ben “The Thing” Grimm’s romantic interest, and also gets ahold of a MacGuffin desired by Doom... it ain’t much, really, but nothing in the Tim Story film managed to be even this interesting. The crude practical effects they use for things like Reed Richards’ extending arms are in some ways more convincing to the eye than the digital cartoon version in the later film, simply because you’re seeing the weight and textures of a real physical object. The Thing suit is not much worse; the main difference is that this one has a more articulated face, but it’s done by puppetry instead of by the face of the actor inside, so it moves very peculiarly sometimes. If you’re looking for some unintentional humor in the film, that’s one place to keep an eye out. By the way... gay subtext? I don’t see it. Some film audiences in the nineties were just a little too... like this. It may sound like I’m praising this film. Believe me, I’m not. This is a dry little turd of a movie that hardly even has an interestingly bad smell. It’s pathetic. But seeing it really drives home just how worthless a big summer blockbuster can be, because the distance between the two versions of the story, despite differing in budget by about three orders of magnitude, is so narrow.